Why does God restate the players of the Gog and Magog War in Ezekiel 39? Vic Batista: We are living in exciting times, right, Nathan? These are not really times to be fearful, for as Christians these are exciting times. Nathan Jones: No doubt. I used to while growing up as kid think we were living in such a dull time. Wouldn't it be cool to be living back with the Medieval knights or some other time period. Now I realize we are living in one of the most exciting time periods in all of human history, because we are the generation that is living when Israel has become a nation again. The Lord said in Matthew 24 that when Israel is a nation again, when the fig tree re-blossomed, that would be the generation that would see His return. That's us! Vic Batista: That's right. And that is why I believe that we are living in such an exciting time. What a privilege and opportunity we have to be alive, for such a time as this. We are here to encourage people to recognize the opportunities that are right before you, so that you don't let them pass by. We have making a journey through this incredible battle called the Gog and Magog War. We have been working through this topic, taking a verse-by-verse, chapter-by-chapter approached, because there is just so much information in Ezekiel 38-39. Let's pick up in Ezekiel 39:1-6. Could you read those for us and lead us through this journey? Nathan Jones: I'll give a tiny bit of background on Ezekiel 38-39 to catch us all up. These two chapters describe a future war. 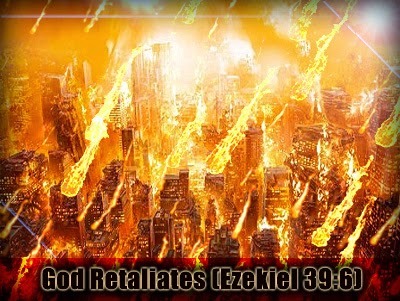 Of all the battles that are portrayed in the Bible, Ezekiel 38-39 is the most descriptive of all the end time battles, even more than Armageddon. "And you, son of man, prophesy against Gog, and say, 'Thus says the Lord God: "Behold, I am against you, O Gog, the prince of Rosh, Meshech, and Tubal; and I will turn you around and lead you on, bringing you up from the far north, and bring you against the mountains of Israel. Then I will knock the bow out of your left hand, and cause the arrows to fall out of your right hand. You shall fall upon the mountains of Israel, you and all your troops and the peoples who are with you; I will give you to birds of prey of every sort and to the beasts of the field to be devoured. You shall fall on the open field; for I have spoken," says the Lord God. "And I will send fire on Magog and on those who live in security in the coastlands. Then they shall know that I am the Lord.'" Vic Batista: Incredible passage! Nathan, once again, for those who are not familiar with these terms Gog and Magog, what are we exactly talking about here? Nathan Jones: Ezekiel wrote this some 2,700 years ago. So, when we try to understand the countries that he is listing here, obviously he's putting them into the names of his own time period. All we have to do is fast-forward to today, for history has proven what the modern versions of these nations are. When we talk about Magog, Magog is the lands that constitute what we call the 'Stan countries today. That would be Kazakhstan, Kyrgyzstan, Uzbekistan, Turkmenistan, Tajikistan and possibly Afghanistan. Magog is made up of those countries. Rosh is the ancient name for Russia. They descended from the ancient Scythian people. Gog is their ruler. Whether he's a man named Gog, we don't know, and probably not. More than likely Gog is a designation for a demon who is behind their government. Gog is the leader of Russia, and so Russia will make an alliance with Magog, which are those 'Stan nations. Gog will also make allegiances with a number of little nations that today comprise Turkey, who in Ezekiel's time were named Meshach, Tubal, Gomer and Beth-togarmah. They are all parts of what is modern-day Turkey. Persia is also listed, which is modern day Iran. Ethiopia is the Sudan. Put is Libya and possibly Algeria and Tunisia. All in all, what we are talking about is a massive amount of territory. These nations comprise an outer ring of what is comprised now of all Islamic nations, except for Russia. Nathan Jones: These nations form a coalition that combines into a horde, a massive army, whose purpose is to come against little Israel in an attempt to plunder and destroy it. Vic Batista: We are seeing right before our eyes what is happening in Russia with their leader, Vladimir Putin. Much of what is being said here are events that are using different country names, like you mentioned, because this was thousands of years ago. And yet, today we are starting to see what is going on in Russia with the development of alliances with all these very same countries. Nathan Jones: It is interesting. We read in Ezekiel 38-39 about how God Himself will put hooks in the jaws of Gog. In other words, God drags him down. He makes it so that Israel is so irresistible to Gog that Gog wants to come and plunder Israel for its wealth. It was only five years ago or so when people wondered why in the world Russia would be interested in Israel's wealth. Sure, Israel has a good economy, and they are a center for diamond trade. They are good business men. But, they really don't have a lot of wealth. Then Israel found two tremendous natural gas finds in the Mediterranean Sea, in their territorial waters. Now Israel is poised to begin production and become a huge competitor in selling gas to the world. Russia dominates the natural gas trade up north, for all of Europe is dependent on the natural gas that flows out of Russia and through the Ukraine, interestingly enough. We wonder why Russia is attacking the Ukraine, well it's because they want to control the gas supply lines that run through that nation. Eventually Russia will turn south, for they will want to plunder Israel and remove Israel as a competitor. All these other invading nations are simply fueled by their Islamic hatred of Israel. These Islamic nations will join with Russia and attempt to annihilate Israel. God feels the need to reiterate in Ezekiel 39 these two aspects about the Gog and Magog War like He already had in Ezekiel 39 almost as if He's providing a double-warning against these nations and their leader, Gog. In the fifteenth segment of our study of the Gog & Magog War of Ezekiel 38-39, Vic and I will look at how the results of this war set the stage for the socio-political landscape of the Tribulation.